Today is international women’s day in case you weren’t aware. So what is it? It is a day celebrating women’s achievements throughout history across all nations. This year is particularly important due to the Time’s up movement and #Metoo. All over the world women are marching to end gender inequality and sexual discrimination. Leicester have put on a range of events to celebrate the many fantastic achievements by women globally. Events include; Bhangra classes, Inspiring Women to STEM Success lectures and poetry exhibitions. One woman who I have always admired is Rosalin Franklin, a female chemist working on the structure of DNA using X-Ray diffraction. Franklin herself modified the X-ray diffraction technique after spending hours painstakingly refining it- resulting in the famous photograph 51 being taken. The photograph was shown to James Watson by her colleague Maurice Wilkins without Franklin’s permission. 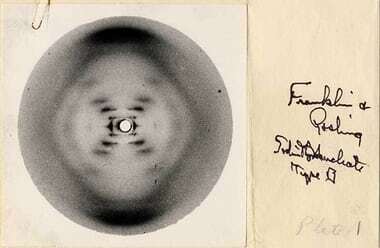 Watson along with Francis Crick was also working on discovering the structure of DNA at Cambridge University. The photo proved that their initial model was incorrect, and that DNA actually existed as a double helix as we know today. Photograph 51 was instrumental in developing Watson and Crick’s model of DNA, and led to them receiving a Nobel prize in 1962 along with Maurice Wilkins. Franklin was not credited in their publication of the work, and died four years prior of Ovarian cancer likely due to the years of exposure to harmful radiation. She received many accolades posthumously for her work as there is no doubt that she made incredible contributions to science in her short lifespan, despite the sexism she faced.